On August 17th 1920, William Struth triumphed over Airdrie on his maiden bow at Ibrox as Rangers manager, taking over from the great William Wilton. This home victory saw the start of a record which stands to this day, of a new Rangers manager winning his first eight matches in charge. Not even the colossal Jock Wallace, the graceful Walter Smith (either time) or the 72-master himself Willie Waddell could manage such a feat, and it has stood the test of 95 years and counting. Until now. With seven out of seven wins in all competitions, Mark Warburton stands on the precipice of a truly extraordinary achievement, of equalling the great Struth and becoming, by that stat, the joint most successful new manager in Rangers’ entire history. Obviously Struth achieved a hell of a lot more than just eight wins in a row, amassing a glut of titles and being regarded by many as Rangers’ finest boss of all time. Times are also very different. Not only were Rangers in the top tier of Scottish football, but this was during both world wars and the post-war world is a very different one to pre. That said, given the fact Warburton has only been in the job just over two months and knew little about the task at hand before arriving, there is no undermining what he has created in such a short space with such a limited budget. And now he is on the verge of equalling that quite astonishing record. The most intriguing aspect of this is where he could do it – Sunday sees Rangers travel to Palmerston Park, to the home of long-time bogey side Queen of the South. Despite securing a win there in the playoffs, Rangers nevertheless struggled against James Fowler’s men, and not for the first time. If Warburton takes his side out to Dumfries and records another good win, not only will he have proven bogey teams are a thing of the past for Rangers (Alloa’s convincing beating dispatched them with aplomb) but he will have emulated the start made by the Great Bill Struth. Of course, he already has achieved history, by being the only manager other than Struth to win their first seven (Waddell previously came closest with six then a draw), but this would be one step further. And that, given the rubbish he inherited and what he has had to do in 10 weeks, would be nothing short of astonishing. Brilliant wat he's done in short space of time, can't wait too watch the team every wkend. Gd times ahead. A proud ger once again! WATP! Mark warburtons blue and white army! Warburton has been a breath of fresh air. Rangers fans have not only had it hard off the park its been so so long since we have been able to be proud of how the team play on the park. Every fan i know cant wait until the next game. I hope the record is smashed well and truly . 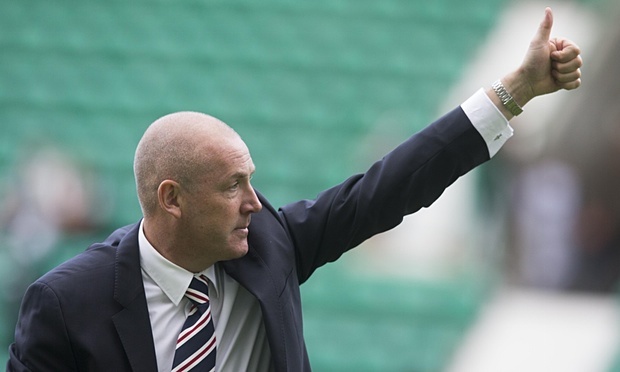 In Warburton we trust. our club has always had great managers (EVERY ONE OF THEM) and all had our great club rangers at heart and that will go on,, WATP. this guy has a long way to go before he can be compared to bill struth,smith,waddle or Wallace,we have played nobody yet,get a grip.